When we think of the many types of people who enjoy climbing in the mountains it is convenient to categorize them three ways; summit hikers, mountaineers, and alpinists. 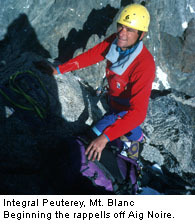 Each is progressively more technically inclined and sophisticated in their mountaineering goals. 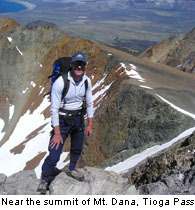 Summit hikers are usually seen climbing easier peaks where they can follow a trail to the top. They are usually fair weather hikers and follow routes that do not require hands for balance and herding is the most common navigation skill practiced. We tend to snicker when we see them clutching a GPS in one hand, a water bottle in the other and not much else, but at least they are hiking in the mountains and maybe they'll go on to learn more skills and become climbers. Mountaineers usually have developed a stronger, basic skill set and are looking to summit bigger peaks with some notoriety and name recognition. They spend more time planning and preparing, developing basic skills, and training physically. Although they tend to follow the path of least resistance, they are testing their determination, sometimes digging deep to find the will power to carry on and make it to the summit because the accomplishment of reaching the top is the primary goal. Alpinists use all the elements of the climbing experience: the route, partners, style of the climb, difficulty, level of commitment, and aesthetics, both from afar and while on it-combine to define the success of a trip. 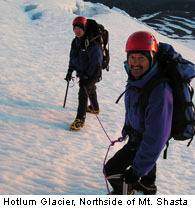 Even the season and weather conditions are considered, not merely with regard to safety, but also in terms of the tools and skills required to make the climb. If a route pushes the limits of a team's ability, so much the better. If the route is easier than the team's threshold they can strive to do the route in better style and less time. There is more to it than simply reaching the summit. The quality of a climb is judged through the lens of adventure where the greater the risk, the greater the reward. At ASI, we want to help you become the best climber that you can be by taking you as far along the alpinist's continuum of skills and experiences as you want to go, any time of year, anywhere in the world. Many of our standard courses are aimed at basic skills, but that is not the limit of where we are prepared to go, just the common skills we teach. The further you progress on this continuum of skills, the greater your reward will be because climbing is a sport that gives back what you put in, and more, like a lifetime of rich memories unparalleled in this world. 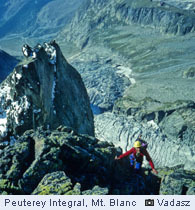 Find the spirit of the alpinist�then let the spirit set you free!